Internationally renowned bandleader Bert Kaempfert was born in Hamburg, Germany, in 1923. A student at the Hamburg School of Music, he was hired by bandleader Hans Busch and played with that orchestra before enlisting in the German Navy during World War II, where he served as a musician. After the war he started his own band, in addition to working as an arranger and producer for the recordings of other singers and bandleaders (in 1961 he hired a little-known band to back up singer Tony Sheridan on his album "My Bonnie". That band was The Beatles). Kampfert had his own hit recording career, beginning with what is probably his signature work, "Wonderland By Night", in 1960. He also had a major hit with the instrumental "Red Roses for a Blue Lady" in 1965--although he did not, as is often thought, write the music for it, he did have a hugely successful songwriting career, some of his most famous compositions (he wrote the music, others wrote the lyrics) being hits for other artists, such as "Strangers in the Night" for Frank Sinatra, "Wooden Heart" for Joe Dowell, "Spanish Eyes" for Al Martino, "Danke Schoen" for Wayne Newton, among others. He also wrote the scores for several films, including A Man Could Get Killed (1966) and the Elvis Presley film G.I. Blues (1960). 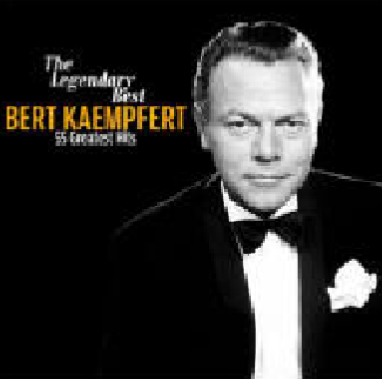 Musicians such as Bobby Hackett, Pete Fountain and Johnny Mathis recorded "tribute" albums of Kaempfert's music. He was an early proponent of what came to be known as "world music", often using songs and musical styles from Africa (one of his biggest hits was called "Afrikaan Beat"). Although his record sales began to decline in the 1970s, he kept up a strong schedule of live concerts, and made a hugely successful appearance at London's Royal Albert Hall in 1974. A heavy cigarette smoker, he died of a stroke at his home in Majorca, Spain, on June 21, 1980. He was 56 years old.